BC Premier John Horgan welcomed word of additional funds to help BC’s wildfire recovery effort after he [if he doesn’t mind saying] bluntly told Trudeau to “bring some cash”. Meanwhile, BC mayor Bob Simpson wants funding to reduce forest fuels in Quesnel’s wildland urban interface area; and Williams Lake Councillor Scott Nelson says the province needs to move faster in salvaging burnt timber. 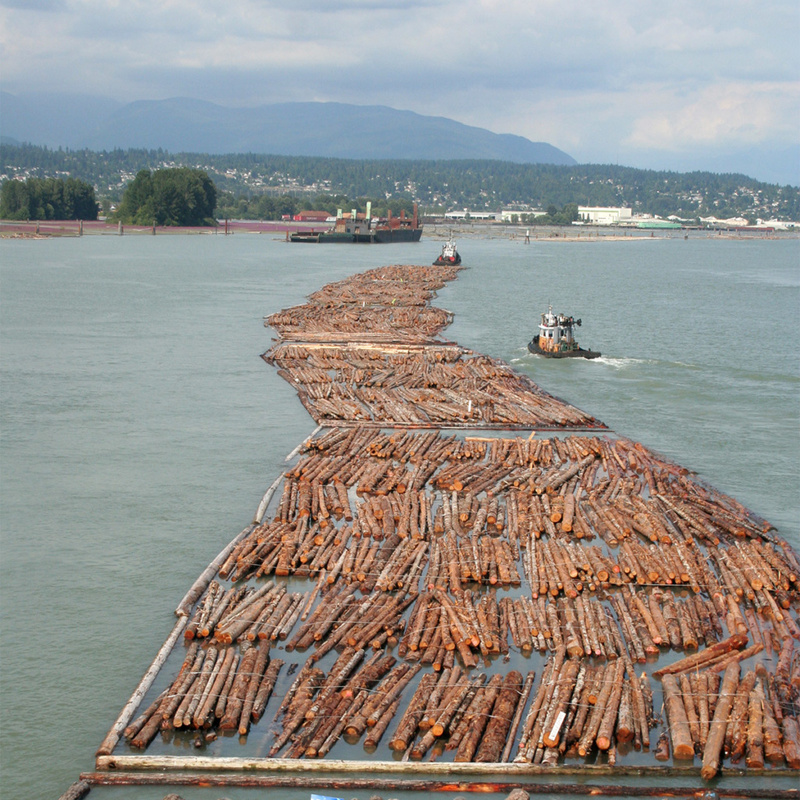 In Business news, Alberta and BC will lead economic growth in Canada notwithstanding the softwood lumber duties, Nick Arkle says Gorman Bros. Lumber will continue shipping to the US despite the increased hassle; and Catalyst pulp mill workers have agreed to a new four-year contract. Finally, an inciteful letter from Peter Lake on how common misunderstandings [on forest fires] can lead to climate change denial; and BC Forests Practices Board Chair Tim Ryan says although its doesn’t “have teeth”, the Board protects the public interest via following up on public complaints and undertaking audits, similar to the auditor general. For once, the global crafting community has produced something kinda solid. Something we can actually use – and something we can actually make that doesn’t need a PHD in PVA glue. This time, it’s a firm alternative to the humble Christmas tree, and it uses just one household staple that you’ll definitely have lying about. We’re talking, of course, about a stepladder. You know, the thing that’s been busy gathering dust for the last year while you carry on forgetting about that lightbulb in the hallway. British Columbia led the country in terms of economic growth between 2014 and 2017, but in 2017 it is expected to dip to second spot after Alberta, according to a Conference Board of Canada report released November 22. Overall, B.C. is expected to see 3.2% real GDP growth in 2017, compared with 6.7% in Alberta. B.C. will regain top spot in 2018, however, with 2.7% growth in 2018, compared with 2.1% in Alberta. The drop in economic growth in B.C. in 2018 will come because of a decline in the housing sector, the report forecasts. …The cooling housing sector will in turn lead to a decline in employment, income, housing and consumer spending growth. Growth in B.C.’s forestry sector will be flat or negative over the next five year due to issues with mountain pine beetle infestations and U.S. duties on Canadian softwood lumber imports. Workers at the Crofton pulp mill have agreed to a new four-year contract. No details of the collective agreement have been released. A statement from Catalyst Paper that owns the mill indicated the company is pleased to have the contract ratified. “We worked hard to achieve a negotiated agreement that recognizes employees’ contributions and reflects the changing realities of our business,” Catalyst’s statement reads. …No comment was offered from the union side. There will always be a market for Canadian lumber in the United States, but that doesn’t mean local producers aren’t taking at least a few of their eggs out of the star-spangled basket. 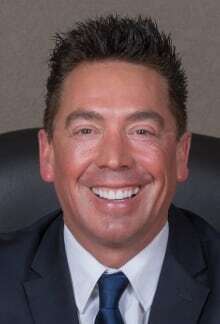 …Nick Arkle is co-CEO of West Kelowna’s Gorman Bros. Lumber. He says the dispute has pushed lumber prices in the U.S. “as high as they’ve ever been” as producers pass most of the financial pain on to consumers. But even though shipping lumber south has become more of a hassle, Arkle says Canadian companies will keep doing it, at least in some capacity. The American market, he said, is “huge,” and tends to pay quite well for “high-value” products, like those produced in British Columbia. However, while companies like Gorman aren’t leaving the U.S. altogether, they have cast their eyes to other markets. TimberWest has donated $25,000 to Somenos Marsh Wildlife Society for a viewing tower over Somenos Lake. The viewing tower, which will be constructed on land owned by Ducks Unlimited Canada and The Nature Trust of British Columbia, will give nature enthusiasts, bird watchers and tourists a new view of the waterfowl, birds, plant life and other wildlife that use the marsh for food, protection and breeding habitat. “TimberWest’s generous gift allows the Somenos Marsh Wildlife Society to complete the wildlife viewing platform at the Somenos Marsh Open Air Classroom,” said Paul Fletcher, co-founder of the society. ..Last year, TimberWest donated the 94.5 hectare Somenos lake bed to Ducks Unlimited Canada. No meaningful progress is being made in NAFTA trade talks between the United States, Canada and Mexico, increasing the odds that President Trump could withdraw from a critical 23-year old agreement. After Round 5 of NAFTA talks ended Tuesday—only two more are scheduled—no progress has been made on divisive issues. “While we have made progress on some of our efforts to modernize NAFTA, I remain concerned about the lack of headway,” US Trade Representative Robert Lighthizer said in a statement, CNN reported. Canadian Foreign Minister Chrystia Freeland said the US put forward “extreme proposals” that “we simply cannot agree to. Some of the proposals that we have heard would not only be harmful for Canada but would be harmful for the US as well,” Freeland added, citing concerns from US and Canadian auto companies. 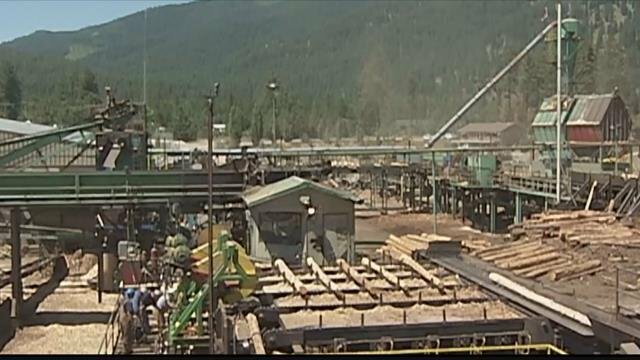 ST. REGIS – There may be some good news this week for Mineral County’s struggling economy thanks to a new operator is taking over ownership of Tricon Timber’s mill in St. Regis. The mill is one of a handful still operating in the once thriving timber industry in Western Montana. But keeping the stud mill going has been a challenge in recent years, as Tricon has struggled against a number of market forces, such as Canadian lumber imports, and a drop in available wood supply. Tricon laid off 90-employees two years ago which was a big economic blow to not only St. Regis, but also to Superior and the rest of the county. But now Coeur d’Alene-based Idaho Forest Group is announcing that it has agreed to acquire Tricon’s St. Regis mill with a deal expected to close on Dec. 1. A new comprehensive guide on Nail-Laminated Timber (NLT) with detailed expert advice is now available for Canada’s design and construction community. Nail-Laminated Timber (NLT) Canadian Design and Construction Guide, the first manual of its kind, combines design, construction, and fabrication expertise from built projects into an easy to use reference. Co-edited by architecture firm Perkins+Will and structural engineering firm Fast + Epp, the free guide provides inspiration and direction to ensure safe, predictable and economical use of NLT, including practical strategies and guidance with lessons learned. This same team produced a similar guide for the U.S. building industry earlier this year. NLT is created by fastening individual dimensional lumber, stacked on edge, into one structural element with nails. North America’s lumber industry helped define what it means to build in the modern era. With the invention of the light balloon–frame, lumber became an indispensable resource to the quickly expanding United States in the 19th century. Over the past 150 years, the process and politics of wood have shaped a highly efficient industry that still provides the vast majority of the U.S.’s house-building material. With new technology, wood is pushing into new territories, and the lumber industry is bracing to respond to these demands. …Although the lumber industry is confident it can handle an increase in demand, there are factors that will need to be addressed. As of yet, there are few standards for producing heavy timber, CLT in particular, and legal definitions are also lacking. A new hotel project may push Okanagan wood construction expertise up a notch. HDR CEI Architecture associate Robert Cesnik and Greyback Construction’s Mike Symonds encapsulated their experiences building the Penticton Lakeside Resort’s west wing in Penticton, B.C. to attendees of the Wood Solutions Conference held recently in Vancouver. Cesnik said mass timber was the chosen material for the project because of its carbon sequestration ability. The hotel also created an opportunity for Okanagan firms to develop an expertise in mass timber construction and current projects include wineries made of cross-laminated timber (CLT), office buildings and residential structures. …But – isn’t wood flammable? Can you really build a wooden building that tall?These are valid concerns and architects are working to dispel with, in search of eco-friendly buildings rather than fuel-intensive concrete and steel. …Canadian architect Michael Green has become one of the pioneers of tall wood structures, and plans for Framework, a 145-feet-tall wooden tower in Portland. When completed in 2019, Framework would be the tallest human-occupied wooden high rise in the world. …Of course, one of the biggest challenges remains in the making of wooden building is deforestation. Do we really want to exhaust our natural supplies? We’re also dealing with the problem of exhausting essential reserves such as oil. Another problem remains to be existing building codes. Present building codes inhibit the ability for architects to build wooden structures taller than four-stories. Still, wooden skyscrapers offer promising opportunities for more ecologically sound construction. Architecture firm Hawkins\Brown used two types of engineered timber to build this swimming facility at a school in Surrey, England. 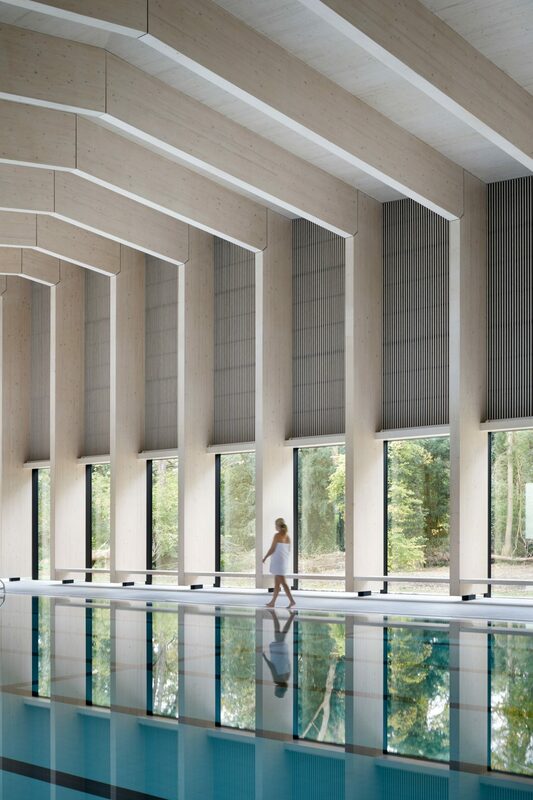 Located at the City of London Freemen’s School in Ashtead, the swimming pool building boasts an exposed timber frame that incorporates windows looking out onto the surrounding woodland. Hawkins\Brown chose materials and construction methods to complement the building’s natural setting. The primary structure is a portal frame constructed from glue-laminated timber – an engineered wood creating from glueing together several sheets of wood in parallel. This is braced with cross-laminated timber panels – a similar but even stronger form of wood, made with layers positioned at right angles to one another. Today, FPAC and the CCFM, were proud to present the Skills Awards for Aboriginal Youth at the Conference Board of Canada’s National Summit on Indigenous Youth and Natural Resource Development in Calgary. The two recipients of the award are Isabelle Males of Temiskaming First Nation from New Liskeard, Ontario, and Tristan Flood of Matachewan First Nation from North Bay, Ontario. “Congratulations” said the Honourable Margaret Miller, Minister of Natural Resources for Nova Scotia, and chair of the Canadian Council of Forest Ministers. “Both winners have shown strong commitment to their communities, an impressive interest in their fields of study, and should look forward to rewarding careers in Canada’s innovative forest sector.” …”Ms. Males and Mr. Flood are both exceptional youth working to improve and support their communities and the forest sector,” says Derek Nighbor, CEO of FPAC. Premier John Horgan has welcomed word of $100 million in additional funds to help B.C.’s wildfire recovery effort, after discussing the issue with Prime Minister Justin Trudeau last week. Horgan said Wednesday the approval for federal wildfire aid was rapidly received after he bluntly told Trudeau in a meeting last week to “bring some cash” to deal with B.C.’s largest-ever forest fire season this summer. “I raised it with the Prime Minister in the morning and a letter came in the afternoon saying the money was available,” Horgan told reporters at the B.C. legislature Wednesday. …B.C. already has committed additional money for reforestation and Forests Minister Doug Donaldson says salvage logging permits are being expedited to allow sawmills to harvest fire-damaged timber. …Business and tourism recovery is a longer project, Horgan said. Plenty of work will need to be done to prevent Quesnel from becoming a wildfire victim in the future, according to the community’s mayor. Citing a recent B.C. wildfire management branch report, mayor Bob Simpson said at least 15,000 hectares of surrounding forest will need to be treated. The city of 9,500 people 116 kilometres south of Prince George came close to being evacuated during this summer’s series of massive forest fires. The incidents have renewed a push for more government funding to clear out potential fuel in areas where the blazes could threaten homes and businesses. …But in the decade since Quesnel’s 2007 wildfire protection plan came into play, just 25 hectares of the wildland urban interface has been treated to reduce forest fuels, according to Simpson. I write you today to express my urgent concerns about the forestry license for management districts 17 and 18 issued to Active Energy Group and/or its affiliated companies Timberlands International and Advanced Biomass Solutions. The forest is a vital resource for Newfoundlanders living on the Northern Peninsula in general and particularly in Main Brook, a town with a deep and rich history in the forestry industry. …I believe that the health and sustainability of our forests and the communities that depend on them are at a great risk and am compelled to speak up. It is questionable whether allowing the Company to exploit our forests for 20 years will provide any net economic benefit to the forests or residents of the Northern Peninsula in the long run. The Shoshone National Forest plans to suspend its own rules along the Chief Joseph Highway Scenic Byway to execute a logging plan meant to remove dead and dying trees infected by the western spruce budworm. 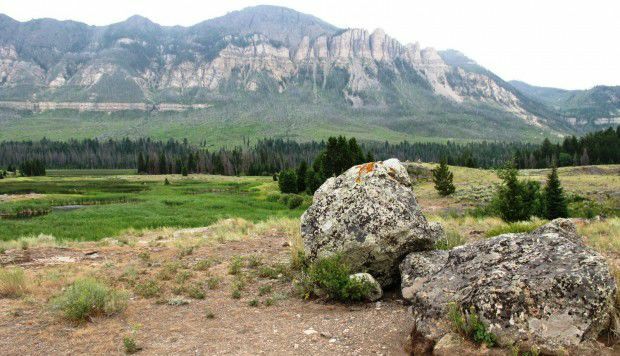 The logging is proposed 30 miles northwest of Cody, Wyoming, along a popular mountain route that accesses the North Entrance of Yellowstone National Park. In a draft environmental assessment released last week, forest officials propose suspending their own scenic objectives along about nine miles of the route, or about 2,000 acres along the road’s corridor. …Wildland fires are an annual threat to the mountain community, the largest of which was the 1988 Clover Mist fire. The addition of the bug-killed trees have increased the potential for “higher intensity” fires, forest officials claim in the environmental assessment. We are excited to shine a spotlight on the Mississippi Forestry Association. They just concluded their annual meeting in Biloxi. Hurricane Nate almost interrupted, but the event was pulled off without a hitch. We were just thrilled to see that a 4-H mother-daughter duo were recognized for their achievements in forestry. Mara Shelton of Neshoba County 4-H received the Outstanding Youth Forestry Achievement Award and her mother Vicky Shelton received the Outstanding Youth Forestry Leader Award. …We appreciate the Mississippi Forestry Association for honoring these true leaders! 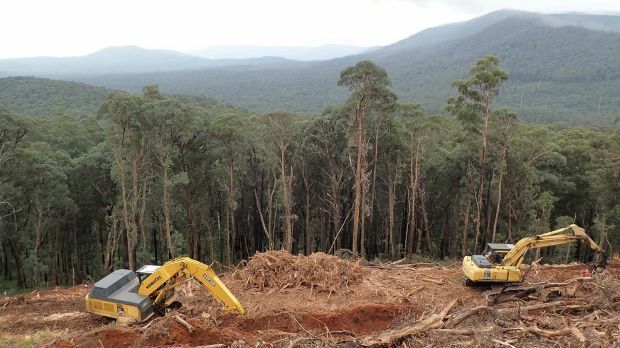 AUSTRALIA — Logging has been suspended at 34 sites in Victoria following a legal challenge that, if successful, threatens the validity of controversial timber operations in native forests across Australia. The development comes as the expiry date looms on many of the 20-year deals between the Federal Government and the states that allow logging of native forests on public land, prompting calls for the system – known as regional forest agreements – to be scrapped. The 10 landmark agreements make logging in certain areas exempt from federal laws. They were designed to end decades of conflict between environmentalists and the timber industry by enabling conservation, recreation and logging to coexist. However critics say the deals have comprehensively failed to protect the environment. …The author, Michael Walkley, made two statements that illustrate a common misunderstanding and the reason that nearly 40 per cent of Canadians still harbour doubts regarding the cause of climate change. …as a retired engineer and physician, I’m familiar with scientists and the scientific method of inquiry. Deliberate falsification is the end of a career. Second, he states that forest fires are the greatest source of climate-change-causing carbon emissions and blames the government for failing to publish this. …The source of the INCREASE in CO2 is from “fossil” fuels, so-called because the carbon was captured from the atmosphere hundreds of millions of years ago before humans had evolved (and when the earth was very different and a much warmer, stormier, wetter place). Climate change is upon us, caused primarily by excessive use of fossil fuels which produce greenhouse gases (GHGs). …The first article in this three-part series pointed out that Swedes, with a climate and population similar to Ontario, enjoy the same economic wealth that we do, using only two-thirds of the energy per person and generating just one-third of the GHG emissions. Part of their success is due to the transfer of power and decision-making from central to municipal governments. This has empowered local governments to invest significantly in biogas generation from waste water treatment, waste diversion from landfills and district heating. This article looks at one Swedish city, Karlstad, which is similar to Peterborough in many respects. Peterborough may be able to emulate some of their policies to reduce greenhouse gases here. In Chequamegon-Nicolet National Forest in northern Wisconsin, it’s easy to see what makes the forests of the Upper Midwest so special. …But climate change is bringing more intense storms – as well as warmer winters. And that affects a forest in several ways, says Stephen Handler, a climate science researcher with the U.S. Forest Service. “You’re extending your growing seasons on one end, you’re not getting that durable frost that freezes the ground that knocks back forest pests and diseases,” he says. …Before the landowners leave, Handler has some important words of caution. 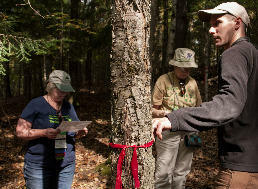 He points out that computer models don’t account for pests like the emerald ash borer. So even though white ash are projected to do well in the climate models, they’re not necessarily a safe bet. Victoria, through projects such as the biomanufacturing plans of Australian Paper in the Latrobe Valley, could lead Australia’s push into the emerging bio-economy, according to the annual report of the state’s forestry industry. In the interim, a key achievement of the past year was the opening of the new Radial Timber mill at Yarram in South Gippsland, said the Victorian Association of Forest Industries report, released on Friday. “The mill is a real boost for the local community, the wider Gippsland region and the timber industry in general,” said the report. …”The practice of sustainable harvesting and regeneration stores carbon in wood products, as well as in regrowth forests,” VAFI chief executive Tim Johnston said. Low emissions timber products also reduced demand for alternatives such as steel and concrete, which embody far greater carbon emissions in their manufacture, he said. THE National Parks Association of NSW (NPA) is urging Premier Gladys Berejiklian to resist calls to burn North Coast forests for power. 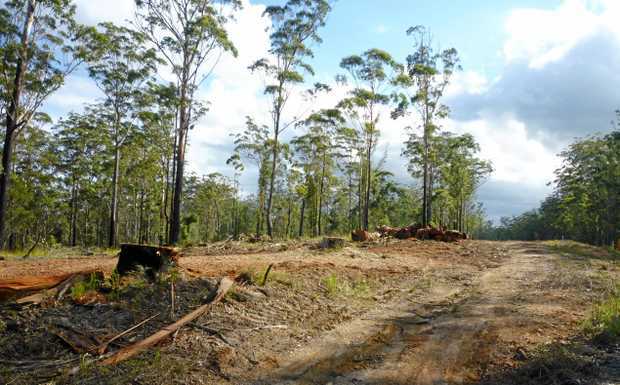 NSW Department of Primary Industry (DPI) advisors touted this “innovative” strategy but ecologist Dr Oisín Sweeney said it’s hard to imagine a worse idea. “Given we know biomass use overseas is driving deforestation, and the evidence that burning forests for power is driving climate change, this is reckless in the extreme,’ he said. “The Australian Government tells us logging removes carbon stores from forests and that North Coast forests have huge carbon storage potential. “Yet here’s a suggestion to log forests and burn them for power.